An indispensable companion for readers, writers, and even casual users of the language, the Penguin Modern Classics edition of Kingsley Amis's The King's English features a new introduction by Martin Amis. 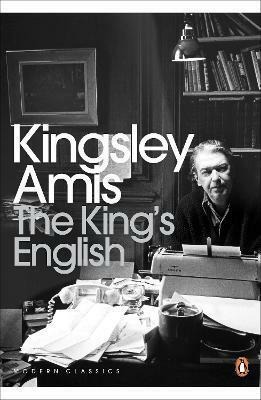 The King's English is Kingsley Amis's authoritative and witty guide to the use and abuse of the English language. A scourge of illiteracy and a thorn in the side of pretension, Amis provides indispensable advice about the linguistic blunders that lie in wait for us, from danglers and four-letter words to jargon and even Welsh rarebit. If you have ever wondered whether it's acceptable to start a sentence with 'and', to boldly split an infinitive, or to cross your sevens in the French style, Amis has the answer - or a trenchant opinion. By turns reflective, acerbic and provocative, The King's English is for anyone who cares about how the English language is used. Kingsley Amis (1922-1995), born in London, wrote poetry, criticism, and short stories, but is best remembered as the novelist whose works offered a comic deconstruction of post-war Britain. Amis explored his disillusionment with British society in novels such as Lucky Jim (1954) and That Uncertain Feeling (1955); his other works include The Green Man (1970) Stanley and the Women (1984), and The Old Devils (1986) which won the Booker Prize. If you enjoyed The King's English you might like Amis's Lucky Jim, also available in Penguin Modern Classics. Kingsley Amis' (1922-1995) works take a humorous yet highly critical look at British society, especially of the period following the end of World War II. Born in London, Amis explored his disillusionment with British society in novels such as THAT UNCERTAIN FEELING (1955). His other works include THE GREEN MAN (1970); STANLEY AND THE WOMEN (1984); and THE OLD DEVILS (1986) which won the Booker Prize. Amis also wrote poetry, criticism, and short stories.